Given a group of particles, we find the net (or resultant) gravitational force on any one of them from the others by using the principle of superposition. This is a general principle that says a net effect is the sum of the individual effects. 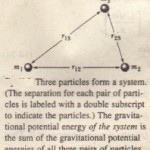 Here, the principle means that we first compute the gravitational force that acts on our selected particle due to each of the other particles, in turn. We then find the net force by adding these forces vector . 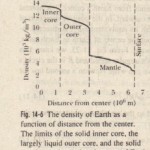 What about the gravitational force on a particle from a real extended object? 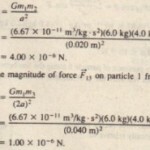 The force is found by dividing the object into parts small enough to treat as particles and then using to find the vector sum of the forces on the particle from all the parts. In the limiting case, we can divide the extended object into differential parts of mass , each of which produces only a differential force on the particle. In this limit. The integral is taken over the entire extended object and we drop the subscript net. If the object is a uniform sphere or a spherical shell, we can avoid the integration of by assuming that the object’s mass is concentrated.